What can I expect from my weekend at the Fall NWMC? We are planning on lot of creativity and fun. The weekend promises to be similar to the spring camp in Oregon, and yet also different! Sound intriguing? We will all get a chance to help shape the weekend. The fall camp will have music and art – opportunities to explore a variety of creative outlets, from visual journaling and songwriting, to classes in guitar, ukulele and many other instruments, to creative non-fiction and photography. Check-in begins at 2 on Friday with time to walk around the lake, play a little music, catch up with old friends and meet new friends. Later there will be structured music gatherings and a chance to hear and see what the teachers have to offer in their classes. Some classes will be longer in length so we can focus on our music and art. And there will be an opportunity to share your own talents: Do you have a special skill or interest that you would like to teach those interested? 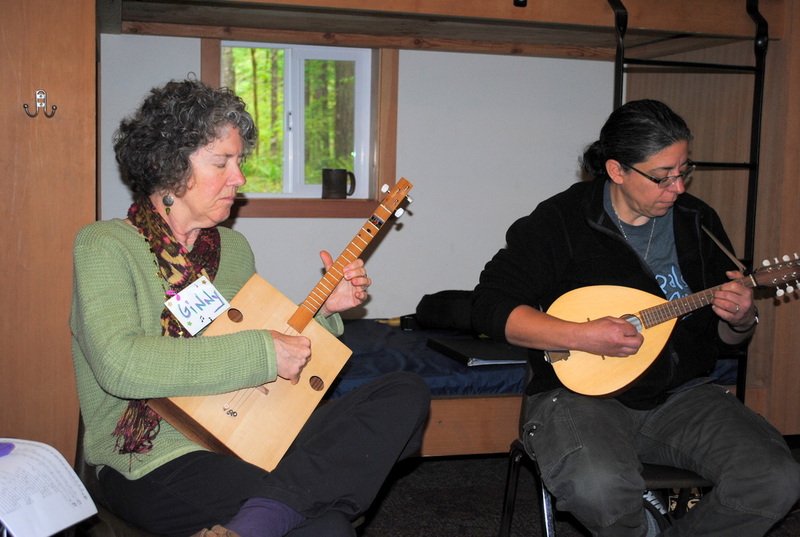 Yodeling, knitting, plant identification, flatpicking fiddle tunes,……….what is your skill or interest? There will be a sign-up posted at camp for these one-time workshops offered by students and staff alike. We will have a chance to showcase our art and music on Saturday evening. Sunday morning rounds out the weekend with more classes and a chance to finish (or almost finish) art projects. And of course there will be late-night jamming and art work for those of us who like to work in the wee hours of the night and morning. Facilities at Pilgrim Firs feature heated cabins with bathrooms and showers in each cabin. Bedding is provided. There is also plenty of room for folks to pitch tents if they wish and there is a quiet parking area for RVs and those who wish to stay in their vehicles (no electrical hook-ups). Bathroom facilities are a short walk from the parking area. There are three lodges, one with a wood floor for dancing and jamming, the main lodge for meals, classes and gatherings and one for classes and gatherings. 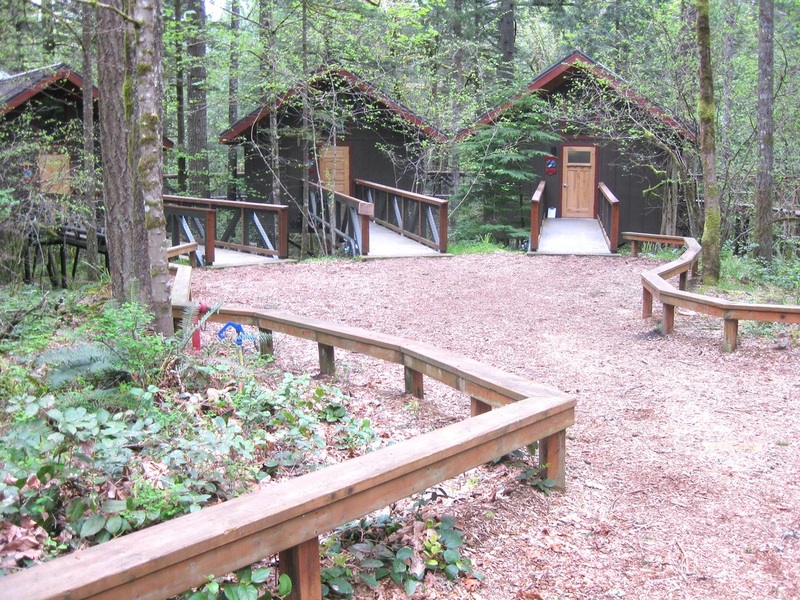 The lodges are handicapped accessible and a few of the cabins are as well. Meals are served buffet style. The kitchen offers choices for special diets as well as omnivores. While they cannot make individual meals for everyone, the kitchen crew does their best to see that everyone gets well fed. There fresh greens and salad makings at lunch and dinner. from my weekend at Spring NWMC? 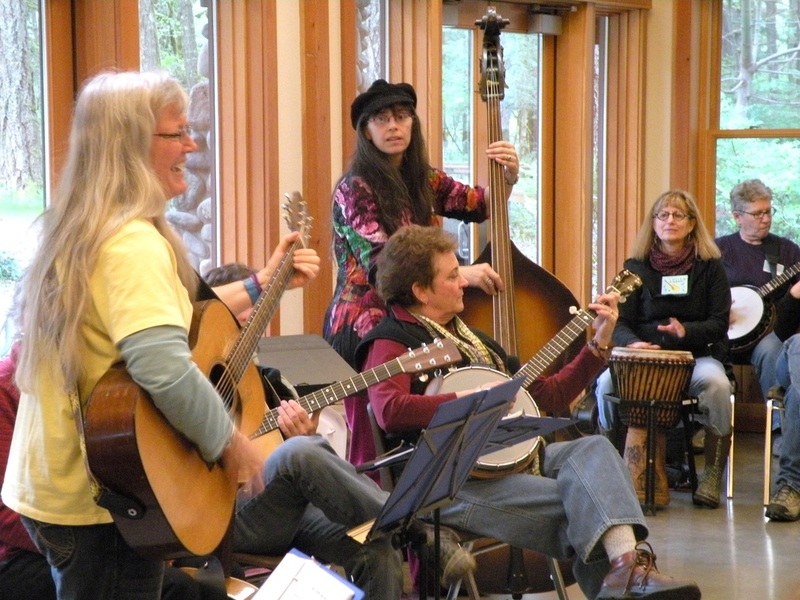 The weekend begins with a song circle with Motherlode and friends Friday afternoon, followed by dinner and an opening session where you have a chance to meet the teachers and learn about classes. Our talented teachers then present a concert . . . a great show! Night owls can stay up for a late-night song circle after the concert. Saturday’s schedule begins with an all-camp choir, followed by three class sessions and free time in the late afternoon. Our Saturday Night Show is an opportunity for campers to perform – either with their class, or with friends and teachers. Those who grace the stage at camp are treated to the most attentive and supportive audience anyone could ever wish for. Then – we dance! On Sunday morning, another class session is held, along with the opportunity to jam or sing or walk along the river. Our weekend ends with an all-camp closing circle – an opportunity to come together to savor the experience and thank all who have made it possible. Facilities at Camp Collins feature modern, heated cabins – most with bathrooms – and a dining hall where healthy, nutritious meals are served buffet style. The facilities at Camp Collins are very accessible and we make every effort to accommodate campers. Here's a link to one camper's retelling of her "Camp Experience"